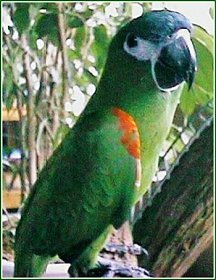 MEGGIE is my female Hahns Macaw. She was hatched sometime in 1995 and moved into my home in Aug.'98... and she moved right into my heart as well! My Meggie is one of the most adorable birds I've ever met. She has a spunky, playful cuteness and an irresistible charm that captivates everyone who meets her. 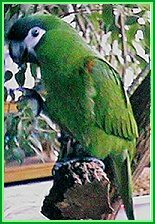 Meggie will calmly lay on her back in the palm of my hand, or snuggle up for kisses, or proudly strut back and forth on her perch with feathers puffed in a display designed to have the maximum effect on her impressed observers. I can tell you... she's certainly made quite an impression on me! Having her in my life is a pure delight! "What're you doin', doin', doin'?" 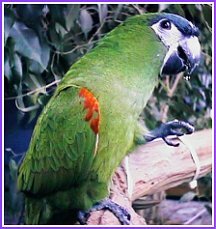 At about 12 inches long, the Hahns Macaw is the smallest of several varieties of the mini-macaw species. 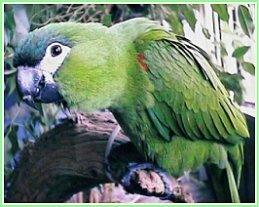 These little birds have all the personality traits of the large Macaws... just packed into a smaller (and quieter) package! But don't let their small size fool you- they're still a handful- always looking for some mischief to get into!! These colorful beauties have a well deserved reputation for being natural comics... and they are intelligent, charming, cuddly, energetic, outgoing, inquisitive, and just plain CUTE! They are very vocal and have the potential to be good talkers. 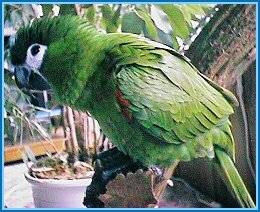 Although they usually don't have large vocabularies, they do have the ability to speak quite clearly in their charming, high-pitched little voices. 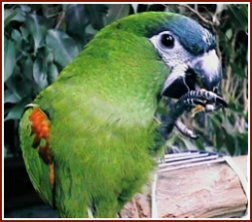 When excited, their squawking can be consistent, but not so loud as to be considered noisy. 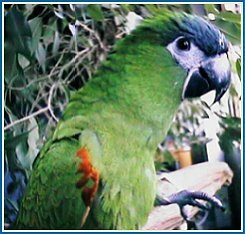 With proper diet and care, their average life-span can be 20 to 25 years.